Rose of Sharon bush blooms mid to late summer. A mid summer giant size bouquet grows right outside my dining room window. Many fuchsia pink flowers appear on leafy green ends of each branch all around the bush. Love Rose of Sharon this time of year for its wow factor. While planting, I was hoping for a spray of color outside the window. I more than got my wish! The fuchsia pink bloom is similar in shape to the rose. It begins as a rose bud look alike before opening to a layered-petal flower. Blooms are abundant. Other bloom colors available are blue, lavender, purple, red or white. No scent for humans. Occasionally bumble bees and butterflies alight to enjoy the flowers’ nectar. A hummingbird inspects the blooms from time to time. But the hummingbird prefers a tubular flower and moves on. Birds rustle leaves all day pecking at insects on the multi stemmed bush. Come winter it is a show piece for fallen snow. Its many grey branches catch snow on the topside becoming a frosted vision. Winter resident birds don’t mind the snowy perch and rest there. 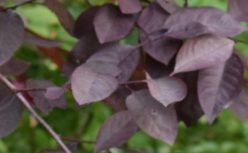 This shrub is easy to care for. Planted six feet away from the back of the house, it soaks up water that comes down the slight incline of my yard. It gets all day sun. At ten feet tall it shades the back of the house from the western sunlight. In fall, after flowers fade, I prune to keep it at ten feet. 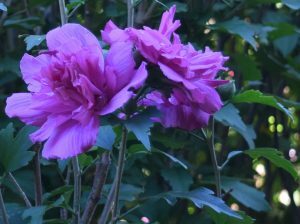 Rose of Sharon can grow 12 feet tall by 10 feet wide. I think keeping it a little lower keeps it bushier. Leaves and flowers tend to be sparse near the bottom. Originally from eastern Asia, it is cold hardy in Zones 5-8. Rose of Sharon tolerates poor soil such as the clay found in my yard. Enrich the soil with compost once a year as that’s what it prefers. I aim to please to keep it healthy! Regular watering during dry spells keeps it happy also. Apparently Hibiscus syriacus (its botanical name) can be a magnet for the Japanese beetle. This might affect the appearance of the bush, but not the health. There are some organic ways to control the beetle such as picking it off the bush and destroying it. Use decoy plants such as zinnias or white geraniums where you can pick the beetle off and destroy it. Toads eat them. Attract toads by placing a broken clay pot with an opening, on the ground for a house. Moles eat them including the larvae which develop underground. Skunks eat them. A skunk had a run-in with my dog so I won’t recommend attracting skunks. Just be aware that they also eat the Japanese beetle. Plant a flowering bush like the Rose of Sharon outside a window you often walk by or spend time near. It is wonderful to see the flowers in bloom or watch the birds and insects move around its branches. Nature is almost in the house!